It is very important that the reference point is the same in all the circuit, so all the ground connections should be connected together! 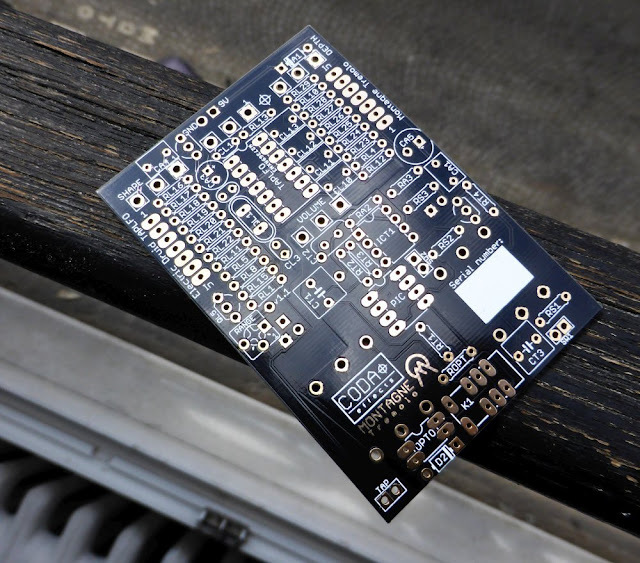 To make it easier, lazy PCB designers like me usually add what is called a "ground plane". It is a large conductive surface that is connected to ground and allows easy connections of grounds together. You can clearly see the cross-shaped pad that connect it to the ground plane. So what happens if you do not connect the ground connections together? By doing that, the reference point is not the same in every ground connection: you create a potential difference that is to say a voltage! Most of the times your circuits will not work, so pay attention to it! 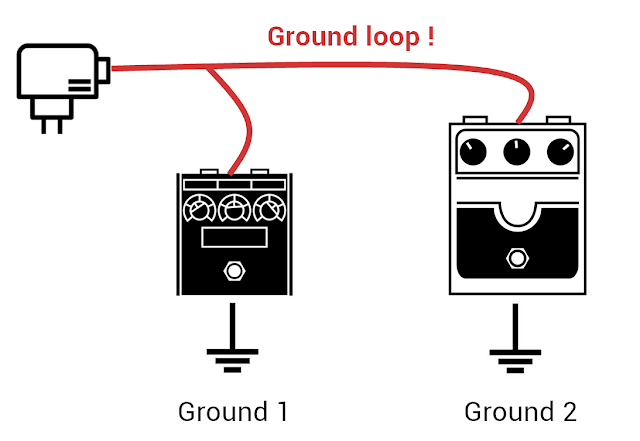 So, what is a ground loop then? Most of the times, ground is connected to "earth". This is the third plug that is usually on your power outlets. It avoid electrocutions by connecting metallic parts of the device to ground. However, it sometimes happens that earth connections are not connected to each other. This can cause a slight difference between the two grounds reference point, creating a small voltage between the two grounds! Even if this difference is generally quite low, it is sufficient to generate a current if you connect these two grounds with a jack! This current will generate noise, usually modulated by the frequency of your outlets (50 or 60Hz depending where you live): it is a ground loop! In this case, the ground loop would be caused by your electrical setup. This happens quite on lot on crowded pedalboards in houses with old electricity installations. However, the same thing can happen between your effects pedals! Sometimes, each pedal can have a reference point that is slightly different and create current in the ground! This is why it is generally better to use power supplies with isolated outputs. However, even with the best power supply available, ground loops can still happen between the grounds of the jacks. You understand that it is no simple solution! This is why it is important in to design pedals that do not have this kind of problem. Ideally, multiple path to connect two different grounds should be avoided. If many paths connect ground together, it can create potential differences that will generate noise! That is why a ground plane should not be divided in several parts. 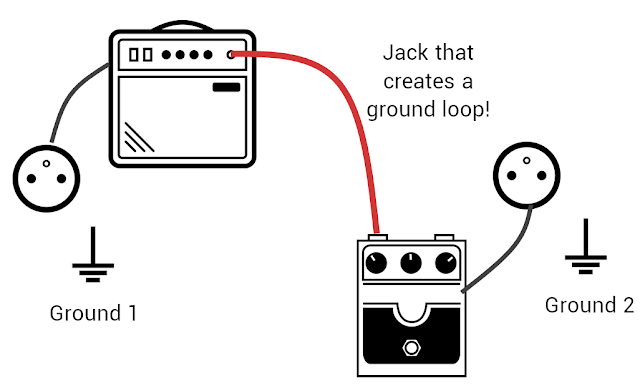 A good practice that I always recommend for your DIY pedals is the "star wiring": connect all ground connections in one point, most of the times at the negative pin of the power supply jack. This is what I recommend in my post about guitar pedal wiring. As you see, everything is very simple... So let's add one more level of complexity: did you know that the ground connection can behave like an antenna? That is why it is very important to connect the enclosure to ground. By doing so, you create a Faraday cage that prevents the circuit from being parasited by outside electromagnetic fields. A metallic enclosure is thus a must to make guitar pedals. Avoid plastic enclosure and use aluminum enclosures like Hammond enclosures for instance. This can also be a huge problem when mixing analog and digital circuits. Indeed, the high frequencies used by digital chips can be received by the analog ground and create noise. It is thus very important to separate analog ground from digital ground physically and connect them only in one point. This was one of the main difficulty that I encountered when I designed the Montagne Tremolo circuit board. It was quite a lot of work to solve it out! There it is, I hope that everything is clear for you now! If not, post a comment! Did you like this post? Like the Coda Effects Facebook Page for more or follow us on Instagram. Icons used to desig the diagrams in this post are from the Noun Project and are protecte under the Creative Commons License. 1. A ground plane is an intentional design choice, not a lazy one, If you work for a engineering manager they will fight you or dictate that multilayer is too expensive. An inner layer gnd plane is recommended, not an outer layer as reviewing skin effect at higher frequencies such as radio frequencies are a culprit of unintended ingress especially if outer layers are not designed as a clam shell with a single reference for all planes and boundary stitching. Connect IC pins, bypass caps is a common mistake in mitigating EMI issues. 2. If a good part placement is made and you place your return paths immediately below forward paths you achieve minimum impedance whether it be a trace or ground plane. You can achieve minimum resistance while crossing paths which is not recommended. Having a gnd plane along with a power plane allows for interplane capacitance which is a distributed capacitance and provides low impedance bypass and effective for HF suppression.